On a recent cruise to Italy, Greece and Turkey, I was struck by not only the unbelievable beauty of the Mediterranean scenery and incredible architecture, but also by just how much we have taken from the innovations of the people who lived there thousands of years ago. Ephesus, Turkey. I was amazed by the beauty of the frescoes and the incredible embellishments these ancient people put into their homes. These paintings are so expressive, colorful and festive. 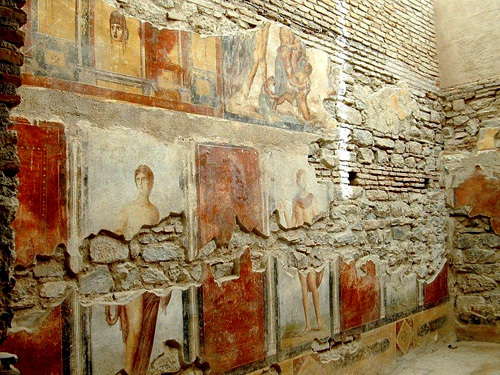 What is fascinating is that in some areas, chipping paint reveals other frescoes underneath the outer paintings. We know that even primitive man would carve and paint drawings on to cave walls, perhaps as decoration, perhaps as a way of recording history (or both). It is interesting to think about people thousands of years ago and how similar they are to modern man. Even then, the fashion in home decor changed and the people who could afford to remodel changed their homes according to the latest design trends.